So one of the bonuses of living in a city where it rained for three months straight and then suffered the worst flood in 30 years is that everything we planted in the garden this year has thrived. 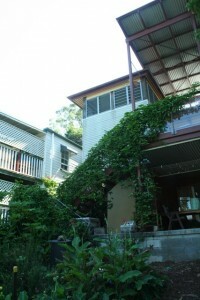 We bought two passionfruit seedlings about a year ago, and put them in to run up our back stairs and back deck railing. And they have just thrived. We previously had one there but moving away from the house for a few years the poor plant just didn’t make it without the loving care and attention (water and food) we gave it, so was just a broken bunch of sticks when we moved back in two years ago (has it been that long already!?). 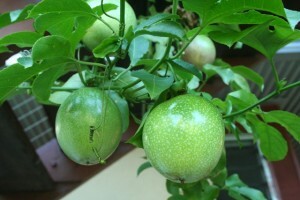 I recall however that it did take more than one season to fruit when we have previously planted passionfruit. Not this time. We are now in the middle of passionfruit harvesting season 1. We have both a yellow and a purple variety planted. And it looks like they will be plentiful for a while. There are literally hundreds of green fruit hanging on the vines, with about 4-5 yellow and 1-2 purple ones ready for harvesting each day at the moment. YUM! 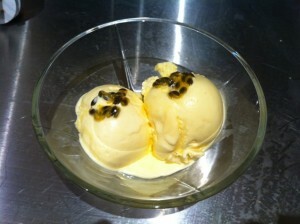 So in addition to eating a bunch of fresh passionfruit each day, I made a slight adult’s treat the other night. And I have to say it is one of the best flavours I have ever made. YUM!!!! David Lebovitz, thank-you!